Paperback, 6.75 x 9.5 in. / 144 pgs / 50 color. Edited by Michael Ziehl, Carsten Rabe, Till Haupt. How do we want to live together? How can citizens directly participate in city politics? How can we shape cities so that they are livable? The world’s cities are changing rapidly as a result of both climate change and globalization, making these questions more relevant than ever. Against this background of global transformation, City Linkage explores the particular importance of artist-run spaces and self-organized cultural projects for the development of cities. 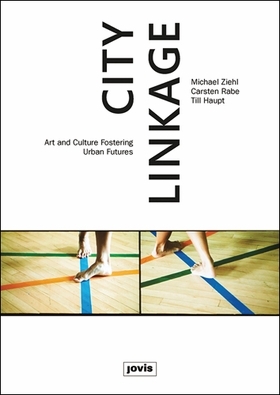 This book looks back to the first iteration of the annual international City Link Festival, held in Hamburg in 2014 and accompanied by an international conference, “Cities, Culture and Sustainability.” In this volume, artists, researchers, activists and theorists introduce practical examples and investigate the degree to which contributions from the arts and cultural sectors can support the manifestation of a sustainable city and improve the experience of urban living. FORMAT: Pbk, 6.75 x 9.5 in. / 144 pgs / 50 color.